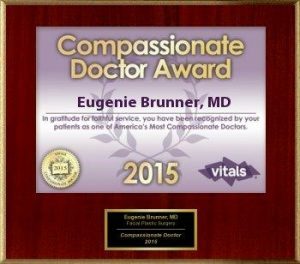 Dr. Eugenie Brunner Named One of America’s Most Compassionate Doctors! Providing our patients with exceptional care and unparalleled results are our highest priorities. Dr. Eugenie Brunner, our experienced facial plastic surgeon, makes an effort to deliver thoughtful, attentive, and warm care to each person, which is why she’s excited to announce her latest honor. Dr. Brunner was recently named one of America’s Most Compassionate Doctors for 2015 by Vitals®. This is the same organization that awards the Vitals® Patients’ Choice (which Dr. Brunner has also received in the past), the Top 10 Doctor, and Leading Expert Awards. A prestigious association, Vitals® reviews leading physicians to assist patients in finding the ideal doctor for their needs and goals. We understand that healthcare and cosmetic surgery are about more than simply achieving the desired outcome; it’s also about the experience of following through on a goal. Our entire team strives to be a source of support, information, and well-being for you during this personal journey. Dr. Brunner is deeply touched to know that so many patients have singled her out for her compassionate care, and she looks forward to continuing to help individuals through aesthetic enhancement.